When you book The Osborn Experience for your cruise entertainment, you're getting a thoroughly modern show. No barking dogs, no clucking chickens. We use current music and current pop culture in our shows so they're always fresh! The Osborn Experience has enough material to do multiple shows, back-to-back or on several nights on the same cruise! You don't have to worry that your cruise line guests will see the same show over and over. Our shows are appropriate for all ages, with content and music specifically chosen to appeal to all. "Now, bring me that horizon." 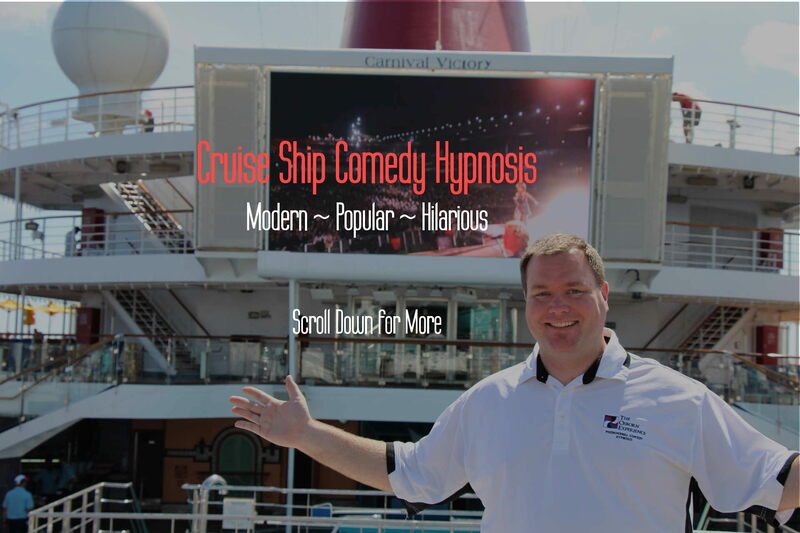 Hypnotist Cory Osborn has a complete package of seminars for your cruise guests! Weight Management, Smoking Cessation, Stress Management, and more are available and easy to produce in almost any cruise ship venue, from smaller venues to main theaters! Need us to handle the lights, sound or other tech? We have a full-time production engineer on staff to interface with your cruise crew to make sure our shows go off without a hitch. We can work from the shore, or bring him along to ensure that your cruisers see the show they deserve! Our show is really easy to produce! All we need is a venue, some chairs on stage, and a place to plug in our sound equipment. That's it! No huge demands for equipment, nothing to onboard at port, and no special accommodations for a big stage crew or props!